Indiana University East awarded six scholarships for the 2014 Summer Research Scholar Program. Undergraduate students receive $2,000 to conduct a research project under the supervision of a faculty mentor. Funding for the competitive program is provided by the Indiana University Office of the Vice Provost for Research and is matched by funds from IU East. All recipients will present their research findings during the seventh annual Student Research Day in spring 2015. Richmond, Ind. 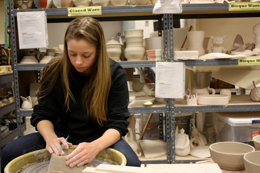 – The Senior Capstone Art Exhibition, which includes works by nine Indiana University East seniors, will be on display in the Room 912 Gallery, located at 912 E. Main Street in Richmond. An opening reception is scheduled from 5-7 p.m. May 2 at Room 912.